Disclaimer: I was given products in this post for the purpose of review. All opinions are my own. I was in no way paid to write this review. We are so watching Alvin and the Chipmunks Valentines collection. We are going to make heart shaped cookies and thanks to Trudeau we are so having a Fondue bar! Zen Fondue Set: Fondues create an intimacy of sharing that is unmatched by other meal traditions. 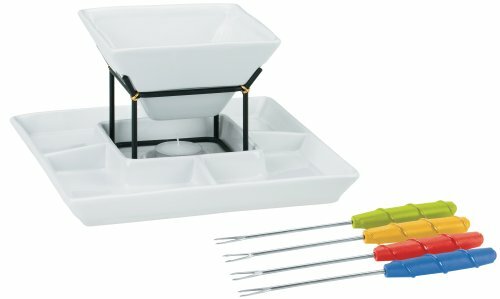 This trendy Zen fondue set lets you share this intimacy with loved ones in contemporary style. The set has a stoneware Zen-shaped bowl for fondue and a divided platter to house assorted fondue dipping ingredients. Four color-coded fondue forks and a tea light to flame the unit along with recipes and instructions are included. Okay so that is copy and pasted. Let me tell you why I love the set. The bowl part is really deep! I was impressed with how much melted chocolate we were able to get inside. Not only that, but the surrounding bowls are perfect for putting our favorite snacks in. I was a bit worried about the flame, since Quinn my 5 year old is a klutz. The long forks though prevent him from ever having to get close. I simple put his fruit or snack on and he is able to decided how much chocolate to add. The color coded handles were also a nice touch, that way we never mixed up our forks. The candle keeps the chocolate warm and melted. And the stoneware was really easy to clean! I just left my bowl soak for little and then it wiped right out. 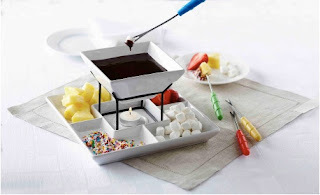 Chocolate is only one the many choices for this Fondue set. We also did a cheese dip, my brother suggest putting in some type of marinara sauce as well. I think this may have been our favorite. We put marinara in the middle then dipped mozzarella sticks, bread-sticks, risotto bites and even garlic bread bites. The entire time our sauce stayed warm.